Curated by The REMIX: Heather Bhandari, Courtney Colman, & Steven Sergiovanni. Borderline brings together four artists working in a space Lasserre refers to as the “excluded middle.” Classifying them as painters or sculptors is reductive. The artists use fabric, yoga mats, vinyl, and steel to question hierarchies assumed by art history, pop culture, and politics. 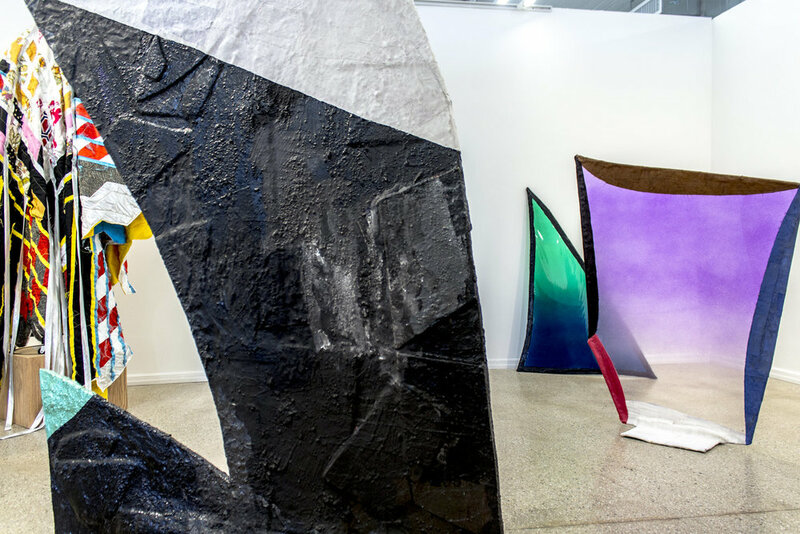 They deconstruct materials and unravel Modern abstraction to address figuration, embodiment, impermanence, transition, and imperfection with astute contemporary perception. Bonnie Collura is known for her multi-dimensional, multi-media sculptures that freeze a collage of references mid-(de)materialization. This exhibition focuses on her most recent textile work that repurposes fabric from prior experimentation to create On Target, an intricate, large-scale quilt draped over a dress form. 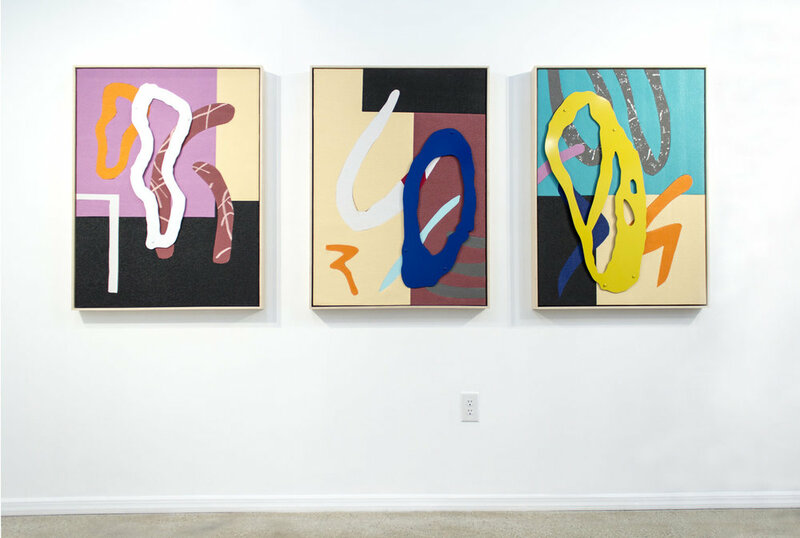 Alex Ebstein’s recent practice concentrates on the painting and collaging of yoga mats. While her relationship to yoga is fraught with personal struggle, the material is ripe with bodily associations that run the gamut from health and peace to shame and impossible ideals. Playing with the palette and stereotypes of fitness culture, Ebstein is able to discuss imperfection and impermanence. Fabienne Lasserre’s work is colorful and physical. Larger-than-life paintings and lens-like, vinyl and steel constructions appear to have freed themselves from the wall. They beckon to be examined from all sides and approached as you would another person. While championing ambiguity, the pieces are powerful, poised, and self-aware. 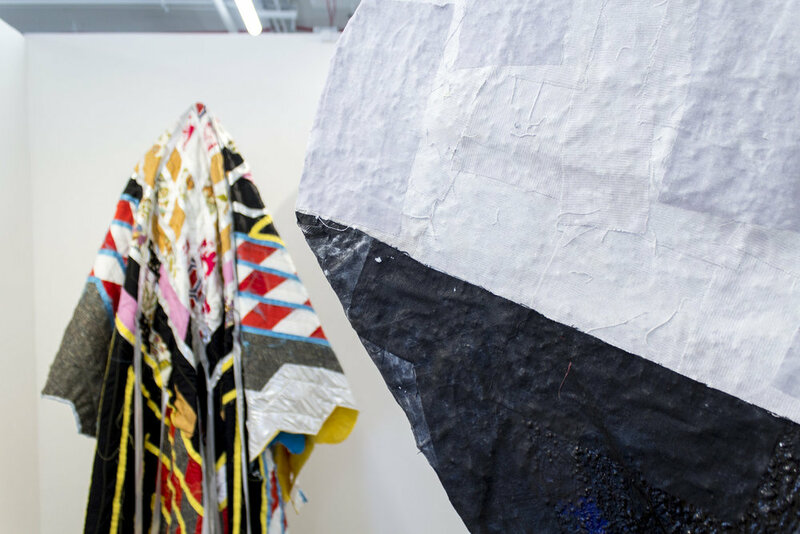 Adia Millett’s quilts speak to the process of deconstructing and rebuilding. 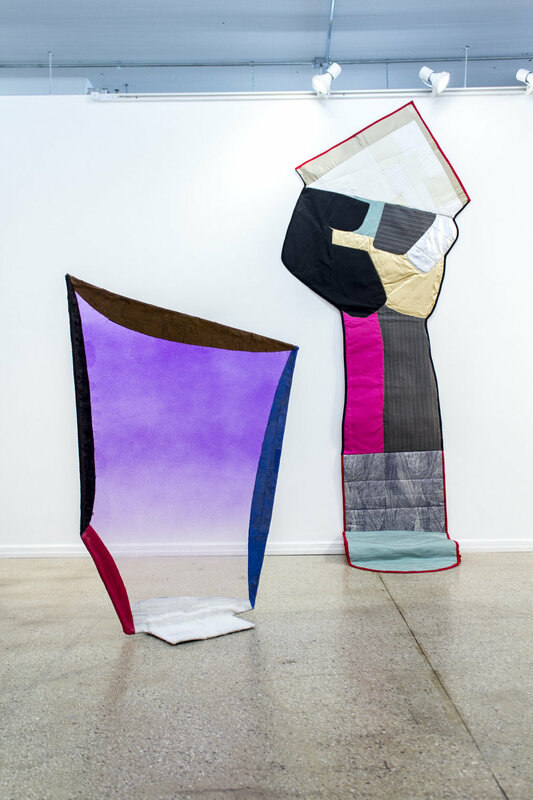 She defies the rectilinear, ornamental expectations of traditional quilts in favor of complicated narratives and varied cultural iconography--from African textiles to fabrics taken from her own wardrobe. She constructs, repairs, and memorializes, ultimately asking the viewer to imagine the piece as a person with a story to tell. Coinciding with the exhibition, Trestle is pleased to host the discussion “Dissolving Borders in the Art World” with The Remix co-founders, Heather Bhandari, Courtney Colman, and Steven Sergiovanni on Tuesday, April 17, at 7pm. Along with audience participants, they will discuss the changes they’ve seen in the art world over the last decade. The REMIX is a project-based curatorial team, established to exhibit the work of underrepresented artists. Founded in 2017 by three former colleagues from Mixed Greens gallery—Heather Bhandari, Courtney Colman, and Steven Sergiovanni—it strives to create and promote new platforms that foster transparency, community, generosity, and the sharing of resources among artists and arts workers alike. Heather Bhandari is an independent curator, consultant, and author based in Brooklyn. The second edition of her book, ART/WORK, was published by Simon and Schuster in October 2017. Bhandari is currently an adjunct lecturer at Brown University. In addition to lecturing and participating in portfolio reviews and panel discussions across the country, she is on the Board of Directors of Visual Arts at Art Omi (Ghent, NY), and is on the advisory boards of Artfcity (artfcity.com) and Trestle Gallery (Brooklyn). From 2000 to 2016 she was a Director of Mixed Greens gallery (New York City). She previously served on the board of NURTUREArt (Brooklyn), and most recently was the Director of Exhibitions at Smack Mellon (Brooklyn). Bhandari received a BA from Brown University and an MFA from Pennsylvania State University. Her career began at contemporary galleries Sonnabend and Lehmann Maupin, both in New York City. Courtney Colman is an art advisor and curator based in New York City. She is the founder of Colman Art Advisory. In 2015, she was named by the San Francisco Chronicle as being a member of “S.F.’s New Art Guard: 5 Women Curating the City.” From 2005 to 2013 she was the Exhibitions Coordinator of Mixed Greens gallery (New York City). She previously was an adjunct instructor at FIT (New York City), and has served as a portfolio reviewer for RISD, NURTUREArt, and the American Society of Media Photographers. She currently serves on the advisory board of Projex Connect (San Francisco). Colman received a BA in Art History from Wellesley College and an MA in Art Market Practices from FIT. Her career began at the Peggy Guggenheim Collection in Venice, Italy. Steven Sergiovanni is an art advisor and curator based in New York City. With over 20 years of experience in the gallery world, Sergiovanni has previously worked at a number of commercial galleries including Charles Cowles, Holly Solomon and Andrea Rosen. Most recently he was a Director of Mixed Greens gallery (New York City). Currently, he is a visiting professor at Pratt Institute (Brooklyn). He regularly speaks at institutions such as FIT, NYU, and New York Academy of Art. He was the former Vice President of the Board of Directors for Visual AIDS (New York City). He holds a BA in Art History from Southwestern Univeristy (Georgetown, TX) and an MA in Arts Administration from NYU. His career began at Jack Shainman Gallery in New York City.